The Integrated Quality Certification (IQC) Group was borne out of the need to reliably manage the certification processes for Quality, Occupational Health and Safety and Environmental control processes that play crucial roles in today’s businesses. 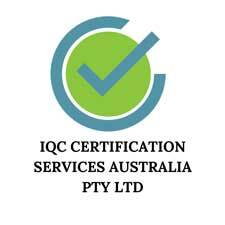 As well as efficiently and effectively helping certify our clients with solutions to achieving Australian and New Zealand Standard Health & Safety Management, Food Safety, Information Security and Social Security compliance, IQC are dedicated to building on our international recognition with our Australian branch. Whether your organisation needs to draw upon reliable resource materials to assist in knowledge building, managing business processes, supplier evaluations, external auditing, project management services, or sharing a vision with customers, IQC are on hand to help your business, whatever the brief. IQC also provides prestigious and career enhancing International Register of Certificated Auditors (IRCA) Lead Auditor courses to strengthen your understanding of the auditing process and department in both your familiar system and others. The audit accreditation courses on offer include certification in Quality Management System – ISO 9001, Environment Management System – ISO 14001 and BS OHSAS 18001. Additionally, IQC are affiliated with IQCS to certify successful candidates in Singapore.